Senate Finance Committee Chairman Max Baucus (D-MT) and Ranking Member Orrin Hatch (R-UT) have indicated they plan to begin efforts on tax reform and that they will start with a “blank slate” – this means that the Federal Rehabilitation Tax Credit (better known as the Historic Tax Credit) is threatened with elimination. •Does it help the economy grow? •Does it make the tax code more equitable? •Does it effectively promote other important policy objectives? We know the Historic Tax Credit to be an economic driver supporting private investment and creating good jobs. We know that the Tax Credit levels the playing field in terms of the cost to rehabilitate existing buildings versus the cost and incentives for new construction. We know that preservation projects revitalize neighborhoods, support local economies, and create lasting improvements. In response to the the letter, Senators are preparing their lists of their priorities for tax reform. Due to the Committee by July 26, the time to reach out to your Senators is now. The call to action is clear, please contact your Senators, especially those that serve on the Finance Committee, and use the following talking points to urge them to retain the Historic Tax Credit! We have provided the federal numbers, please include examples of successful tax credit projects in your state or district. The Historic Tax Credit represents a greater return than investment for the federal government; generating $25.9 billion in federal taxes (data from the National Park Service) while costing $20.5 billion (data from the IRS). Projects utilizing the Historic Tax Credit have generated over $66 million dollars of private investment into historic buildings and communities. The Historic Tax Credit creates jobs – 2.4 million jobs to date, with an estimated 75% coming from within the project’s region, and the majority being better paid than those associated with new construction. Since 1977 the Historic Tax Credit has incentivized the rehabilitation of over 38,000 buildings across the country; over 1,000 projects have been approved by NPS in 2012. The Creating American Prosperity through Preservation (CAPP) Act proposes strategic adjustments to the HTC that would enhance the credit’s economic and sustainability benefits. 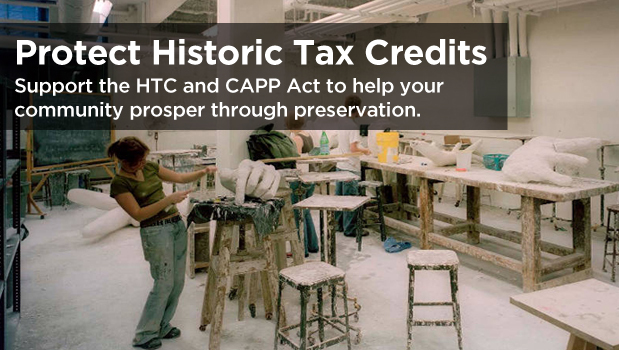 Additional information to include in your communications about the power of the Historic Tax Credit can be found on our website: http://www.preservationaction.org/priorities/historic-tax-credits. We are prepared to assist you in contacting your Senators. If you have any questions please contact or call Preservation Action staff at 202-637-7873 with your questions or comments.